Quidditch is a sport invented by J. K. Rowling for the wizarding world, of course. But that didn't stop college students across the country from bringing it to life as a Muggle sport. The main sticking point is the "Snitch", which in current play is represented by a cross-country runner. The motivation for this project was to replace this person with a robot. To that end, we sought to develop an autonomous quadcopter, equipped with sonar sensors which it would use to evade stationary and moving obstacles. Due to time constrains and difficulty in software and hardware implementation, the goal of flying was not achieved. 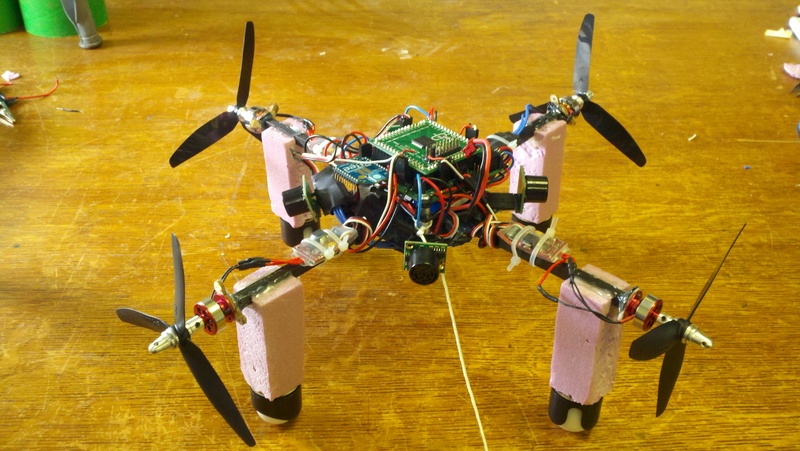 In the end we focused on the other objective — using sonar sensors to avoid obstacles — and converted the quadcopter into an air-propelled ground robot.